Surprise guests and clients with a promotional product that will make a lasting impression! 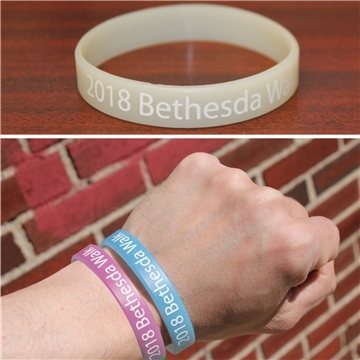 Our UV Silicone Wristband magically changes color in the sun. Great for promoting outdoor fundraisers and cause events, available in 4 colors. Good deal for that cost! We ordered these to be given away from our church for a "safe Halloween" event. The response was great. Product was exactly what I wanted. Very pleased with product and service from Rosy. Looked good, the quality was less than expected, but overall okay with the users. I was pleased with the appearance and function. They were very popular. It looked exactly as I expected. The preview showed me exactly what I would be receiving. Much better than what we had expected. It is very useful and a lot of our trade show attendees have said they love it.